CBS News may have bungled the Benghazi story, but as usual, CBS Sunday Morning did the network proud. It always does. This show is television at its finest. The topic this week, Nov. 17, 2013, was the 50th anniversary of the assassination of John F. Kennedy, 35th President of the United States. There is something about this news show. I can't help but note what a superb job they do in their news magazine-style coverage. It is not specifically entertaining as is most of television news these days; instead its real news value is gripping and engaging. After all, there is so much more to the Kennedy story than its sad ending. It would have been easy to simply cover the horrific, sensational events in Dallas on Nov. 22, 1963. That day is one in which thousands of words have been written. It is a story in and of itself. But CBS News did so much more. They always do. In their coverage, they painted a picture of the time. They covered Kennedy's Presidency, including the Cuban missile crisis and the cold war with Soviet Union, and the enormous appeal and presence of Jacqueline Kennedy. They even touched on the huge, though slightly lessening number of Americans that don't believe the official Warren Commission Report identifying Lee Harvey Oswald as the lone gunmen that killed the President. They spoke to the niece of Jack Ruby, the man who assassinated Oswald while America watched. They even talked about the late Vaughn Meader, the hilarious comedian who impersonated Kennedy, whose rapid rise to comedic fame died the day Kennedy was killed. I was just a child, and our family was not very political, but I remember Meader's comedy album. In those days making fun of a President was done with good humor. Even Kennedy joked about it. What a contrast with today when making fun of the President is done in the name of hatred and malice. The day Kennedy died was the day America lost its innocence. There remains a glimmer of it now and then, but so much more than a President died that day in Dallas. One of the country's greatest losses has been trust. But every Sunday morning, I am reminded of the sustaining quality of the kind of television I grew up with. CBS Sunday Morning does a good job. This is a good journalism that I think is still worthy of my trust, with much credit to Charles Osgood who is a quality, old-school journalist. So in these dark days of television, may this shining light continue. I signed onto my computer this morning just as I always do. After Windows sang its Good Morning song to me, in the form of its single-note repertoire, I watched as all my applications loaded. I thought to myself, as is customary, that I really must streamline my start menu. Finally, my day was about to begin. I clicked on my browser icon—Chrome--in the task bar. I saw the familiar Google search box. BAAAAAAHHH! I pressed the home button on my toolbar. There it was again. My old friend was gone! Then I remembered what day it was—November 1, 2013. Today is the day I’ve dreaded—the day my iGoogle was to be killed and buried, in one fell swoop. It is never to be seen again. Gone are my three separate pages filled with links I loved. Granted, I didn’t use all of them all of the time, but I liked having them around. Like comfortable shoes, these were some of the bookmarks I’ve had since I first created my iGoogle page in 2005. I’ve lost an old friend. I fondly recall there was no better day than one when Google would announce it had added new features to upgrade iGoogle. I loved the themes, the many ways to customize my start page. It always made me feel like I had brand new software. You know that feeling. It is almost euphoria. The very first thing I do when I get new software is change the colors. iGoogle was highly customizable, and I liked that a lot. My desktop often displays one of my favorite photographs. I used to coordinate my iGoogle to match. I like matching color schemes in all things, but especially on my computer where I devote so much of my day. That’s just me! For the last several years I have had a sunflower photo on my computer, one that I took in my own back yard. There is a little ant on one of the petals. The yellow petals stood out from the background that was a blur of green tones. The only iGoogle theme I could find that matched was one that displayed greenery with water droplets. The combination was beautiful. The most important part of picking a theme was not so much the picture, but the overall color of the page. In my case, it had to be yellow. The yellow and green tones matched my sunflower well. The only thing that ever bothered me about iGoogle was that I couldn’t change the color of the links. They were always that ugly bright blue color. The ideal would have been to make them dark green, but I could never figure out how. Months ago, because Google gave us iGoogle aficionados fair warning of the death of our favorite start page, I began to look around for a replacement. I settled on Startific, which came highly recommended. It is a different concept entirely, but is also highly customizable. I created my page to include the same sunflower picture that is on my desktop. It is really quite lovely. This morning I changed the link on my home button to the Startific page. Such finality! If I have to be completely honest, it is really a more attractive page than iGoogle was, and is even more customizable. I haven’t really played with all the icons and widgets, although I had already put the ones I use everyday onto the page. I have a Facebook button, a Twitter button and buttons for all of my blogs and web page. There is one button though, that was the most important to me. It was the one I used on iGoogle the most. It was the first one I put onto my new page. It is the Intellicast weather page. By inserting the correct URL, one click and it opens right to a radar loop in my home state. As far as I’m concerned, Intellicast has the best weather info. I’ve used it for years. Startific still has a few kinks that need to be ironed out. The worst is the Amazon ad that shows whenever the browser opens. It takes up a large chunk of real estate on the right side of the application, but it can be clicked off. I keep telling myself, change is good. It will keep me young. The older I get though, the harder I have to work to convince myself. Is it possible that people are simply too easily offended these days? Haven’t we taken politically correct to a dangerous extreme? When we start crying racism over Julianne Hough wearing dark makeup on her face as part of a Halloween costume portraying a character from a television show, haven’t we crossed a line? I refer to the outrage over Hough trying to make her Halloween costume authentic. How is her applying bronze-toned makeup any different the apparently acceptible practice of sunbathing or using a tanning bed to darken the skin? I’ve heard black people who have complained say that why she did it didn’t matter. The fact that she did it makes her guilty of racism. I disagree. Motive is key. There is no evidence to point out that Hough’s intention was to demean or demoralize. In fact, her intention was to flatter. She meant no harm. And, she is an actress. Portraying a character is what she does. She shouldn’t be chastized for doing what she so well. Personally, I’ve never seen the show “Orange is the New Black” nor do I know anything about the character Crazy Eyes, that Hough portrayed. There is absolutely no kind of excuse for such a hideous display. Forgive me if I’m wrong, but isn’t our goal as a society to obliterate racism? Interestingly, these two costumes evokes different reactions from white people and people of color. Based on the comments posted on social media, anything to do with black face, which is what has been charged in Hough’s costume, is very offensive to black people. White people don’t necessarily see it that way. Yet, I the other example, the Trayvon Martin costume which portrayed a murdered child evoked anger by both black and white audiences. Interestingly the outrage was equal for both both blacks and whites. Yet, Hough’s costume with her darkened face elicited comments generally along racial lines. Perhaps this illustrates a path to real correctness. Perhaps we all need to be more considerate of other people’s feelings. Perhaps we need to understand and recognize that actions can cause hurt feelings. Perhaps we also need to recognize that sometimes, even though we take something to heart, that it may not be intentional. Therefore, we need to all become more tolerant of one another. Isn’t it possible that tolerance is the prescription for stamping out racism and curing hateful behavior? Racism is an ugly part of the history of this nation. It is outrageous to think that at one time, it was accepted for one person to be able to buy and sell or own another human being. The outrage isn’t unique to black people. From the first time I heard about slavery I found it to be appalling. While I have not experienced slavery, that doesn’t mean I don’t understand it; it doesn’t mean I’m not empathetic to those who experienced it. I know what it is like to be bullied, teased, verbally abused, made to feel worthless, but I refuse to let that define me. American history, which is fraught with ugly, hideous events, have served to teach us and to make us better in the long run. As much as we want to denounce the negative parts of our past, we can’t. They happened. We can only turn them on their heads and make them a positive. If we want to learn how to deal with racism, we are fortunate to have one of the best examples among us. All his life, U.S. 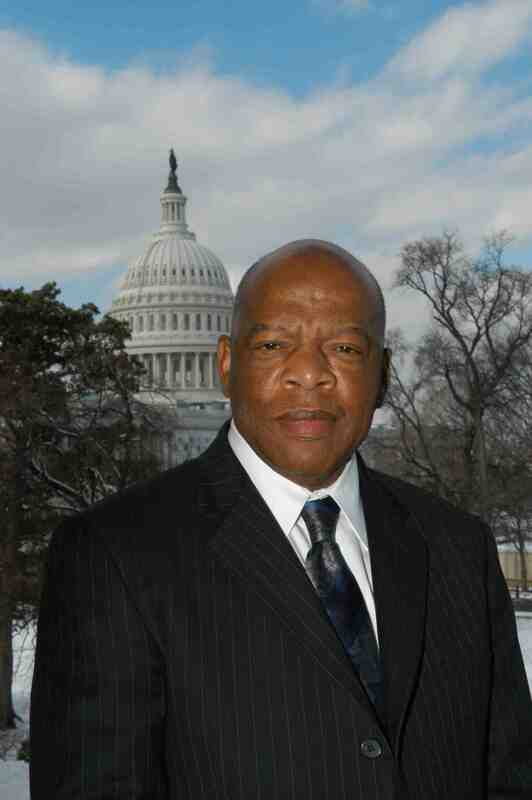 Congressman John Lewis, (D-GA) has already demonstrated over and over again how to turn racism and hatred on its head. John Lewis spent his life as a Civil Rights advocate. He was victimized by some of the most bloody, ugly, hateful moments of this country’s history, yet he was also there to see the changes. He was inspired by the hopeful words of the Rev. Martin Luther King and moved by actions of Rosa Parks, a black seamstress who refused to give up her seat on a city bus to a white man. Lewis was a young man when he volunteered to participate in the Freedom Rides. It was 1961, when he and a group of black activists rode interstate buses all through the south in an effort to desegregate public transportation. The south was as divided then as it had been 100 years before, during the Civil War. During one of the rides, Lewis was beaten by a hateful man dressed in the white cape of the Ku Klux Klan—Elwin Wilson. Wilson had been involved in cross burnings and violence against black men, including Lewis. Yet in 2009, Wilson, moved by the election of Barack Obama as the nation’s first black President, wanted to make things right after carrying the guilt of his past for so many years. He wanted to apologize publicly to the man he had beaten bloody nearly 40 years earlier. What was the most remarkable about the meeting of the two men was not just the way Wilson turned around the racism that had embittered him years before, but the grace at which Lewis forgave him. John Lewis is an example for all Americans. His turn-the-other-cheek attitude is, in my view, the right way to deal with racism. If we all follow his example, maybe one day we can retire the word and the hateful concept behind it. Former Congressman Jesse Jackson, Jr. is now serving time in prison. The $750,000 judgement against him remains unpaid, but he will still be paid public money. Jackson, who pleaded guilty in federal court in the District of Columbia, begun serving 30 months in prison Tuesday after he pleaded guilty to conspiracy to commit false statements, mail fraud and wire fraud earlier this year. He was convicted last February for pilfering cash from his own campaign fund to support an overly lavish lifestyle, Jackson, 48, had a penchant for expensive vacations, night clubs, furs, a Rolex watch, and pricey collectibles once owned by the late Michael Jackson and other celebrities. He also spent campaign cash to remodel his house. Despite Jackson’s fall from grace, the ex-congressman remains eligible for $8,700 per month in disability due to his mental state. He has been diagnosed with a bi-polar disorder as well as suffering from depression. Last year, coincidentally, around the time his political star was losing its luster, Jackson disappeared from public view. When he resurfaced again in August, he announced that he had been at Mayo Clinic where he had undergone treatment for a bi-polar disorder coupled with severe depression. As a former congressman, Jackson will also remain eligible for a partial federal pension of $45,000 annually. The U.S. Marshals Service auction, of some of Jackson’s seized assets was canceled two months ago, when the authenticity of some of the items was questioned. The remaining funds will come from the sale or refinance of the Jacksons Washington, D.C. town home. The property was on the market for a short time last year. It was listed at $2.5 million. Jackson’s wife Sandi, a former Chicago alderman who ran her husband’s campaign office, pleaded guilty to tax fraud. She received a 12-month sentence in prison as well, but the two will not serve at the same time. A judge granted the Jacksons’ request to allow them to serve consecutive terms in prison. Sandi Jackson will remain free until after her husband’s release from prison, so she can take care of the couple’s two children: Jessica, 13 and Jesse III, 9. When I was a little girl I lived in the city--in a south side Chicago neighborhood. During the summers, my brother and I played in the vacant lots where I can remember seeing an abundance of those familiar orange, black, and white of the monarch butterflies as they flitted from one flower to another. Everywhere you turned your eyes, the view was filled with their delicate wisps of color. There were always dozens of monarchs, fritillaries, swallowtails, and skippers along with bumble bees, dragonflies, bluebirds, to name a few. But times have changed. Even though I live in the woods now, I rarely see monarchs. In fact I haven’t seen one in two years. The scientific community is concerned with the number of monarchs, the only North American butterfly known to migrate. Monarchs are rapidly dwindling in numbers. According to the NY Times, the number of monarchs over the past 15 years has lost as many as 81 percent between 1999 and 2010. Recovery has been slow. The spring of 2013 reported Mexican forests contained the fewest number of monarchs in 20 years. Some are concerned for the future of the species. Several factors have contributed to the decline of these amazing insects, on both ends of their migratory path which ranges which takes these cold-blooded insects from northern Minnesota and Canada to Mexico. In Mexico, the monarch’s winter habitat is being decimated by Illegal logging and climate change. “Earth Sky,” a daily radio series and blog about science and nature, reports that nine hibernating colonies occupied three acres during the 2012-2013 winter. But that isn’t the worst of it. The life cycle of the monarch is reliant on milkweed, the plant on which the adult female lays her eggs. Milkweed is the only plant a monarch caterpillar can eat. Milkweeds have long been considered a pest by both farmers and homeowners alike, resulting in record numbers of them being killed with herbicides. Glyphosate, the chemical contained in Roundup made by Monsanto, has effectively sterilized farm fields. Roundup Ready corn, soybeans, and other genetically-engineered crops have been modified to resist glyphosate. The result is that only the crop survives while everything else, including the only plant monarchs rely upon for survival, does not. According to the NY Times, “there is a direct parallel between the demise of milkweeds--killed by the herbicide glyphosate, which is sprayed by the millions of gallons on fields where genetically modified crops are growing--and the steady drop in monarch numbers. Some people interested in preserving the future of these amazing insects are trying to reverse this trend. Monarch Watch, an educational outreach program based at the University of Kansas, engages citizen scientists in large-scale research projects. Since 1992, Monarch Watch involves 2,000 schools, nature centers, and other organizations across the United States and Canada. Monarchs are tagged and counted each fall. “To assure a future for monarchs, conservation and restoration of milkweeds needs to become a national priority,” the group says on its website. They encourage the creation of Monarch Way stations in backyards all across the country. They hope to preserve the species and continue the spectacular monarch migration phenomenon. I have ordered my own milkweed seeds. I really am anxious to do my part to help. I have a few milkweeds on our property, but obviously not nearly enough to attract monarchs. I hope to change that in the coming years. Doomsday predictions; the possibility of the United States failing to pay its bills for the first time in history, may be averted. At least that is the hope of Senate Leaders Harry Reid, (D-Nevada) and Mitch McConnell, (R-Kentucky) who have been working on a bi-partisan compromise they hope to sell to their own members as well as the deeply divided U.S. House. According to the New York Times and several other sources this morning, the two worked into the night Monday to craft a plan that would pass a resolution to finance the government through Jan. 15, putting the U.S. government back in business and raise the debt limit through February. The deal would also establish a budget committee by Dec. 13 to replace the automatic budget cuts that were put in place by the sequester. Sequestration--unappealing across the board cuts—were the result last March from failed budget talks between Republicans and Democrats. The upcoming Senate deal, as reported includes no real changes to the Affordable Care Act, though there may be some minor ones. House Speaker John Boehner, (R-Ohio) was alerted by McConnell. Boehner failed to react one way or the other. His position is at least consistent, since Boehner has failed to react to much of anything the Senate has done to keep the government open. Boehner’s lack of reaction to the Senate’s Continuing Resolution (CR) is what sparked the government to furlough federal workers and close its doors to offices, landmarks, and parks all across the country—now in Day 15 of a government shutdown. It is believed by both Republicans and Democrats that the entire shutdown could have been avoided, had Boehner simply allowed a clean CR to be brought to the House floor for a vote. Instead, the Republicans in the House tied numerous measures to the resolution that had no chance of bi-partisan support. With more than 40 attempts by House Republicans to repeal the Affordable Care Act, commonly referred to as Obamacare, the House attempted unsuccessfully to pass a CR with strings attached. At first, it was tied to gutting the Affordable Care Act through several varied measures. On Oct. 1, the Affordable Care Act went on line and millions of people attempted to sign up for health insurance, some for the first time in their lives. With the law fully implemented, there was no longer any point to tying the law to the CR so Republicans tied other provisions to it with efforts to reopen government programs in a piecemeal fashion. It was no coincidence that amendments House Republicans offered were similar to news events and photo ops, such as the World War II Veterans Memorial or the National Institute of Health where ailing children were prevented from receiving cancer treatments. That photo-op included several House members dressed in medical garb. Democrats stood firm, refusing to give in to House demands to have it their way. Boehner and other House Republicans continued their attempt to send the message that Democrats were to blame for the government shutting down because Democrats refused to compromise. Boehner never bothered to mention the months since March that he refused to appoint a conference committee to reconcile the House and Senate versions of the funding bill. He also failed to mention that the Senate’s CR set the spending limit at $967 billion, a figure derived by House members. Senate Democrats wanted the limit to be $1.058 trillion, but they compromised. What is different this time? Why would Boehner take the Senate deal now when he wouldn’t do it for the last 15 days? Boehner has said in the past that he has no intention of letting the government default on its debt. The stakes are high. House Republicans have gotten messages from their pals with the purse strings. Wall Street has issued warnings that a government default would have dire consequences. Treasury Secretary Jack Lew testified before the Senate, painting a grim picture with world consequences of a default. Koch Industries, ironically, has written a letter to senators urging action to avert a debt ceiling crisis. Republicans approval rating has plummeted, with Americans largely blaming them for the government shutdown. Mitch McConnell, who is facing an election in 2014 knows that. While he has largely been silent during this debacle, he has stepped into the fray to work with Reid on a deal. If it is successful, his political star could rise once again. If not, well, it could be meteoric calamity. Boehner is at a crossroads. With his speakership in jeopardy, he is going to have to make a decision. He has been trying to appease the tea party caucus, with its anti-government rhetoric. On the other side are more reasonable Republicans, some of which have seemingly broken ranks with the speaker. They have been prevented from acting on their own due to an amendment to the House Standing Rules by Pete Sessions, (R-Texas) Republican-heavy rules committee that prevents anyone but the speaker or his designee from introducing the CR to the floor. We are close to the eleventh hour when deals are made. The stakes are high, not just for the American people, but for the individual members of congress. Next year, the House members will face re-election. Their reputations are at stake. It may not be pretty, but they probably will get it done.